Are you ready to pay the extra 25p Latte Levy? According to the media, the Government could soon be charging a 25p Latte Levy on take-away hot drinks to help cut down on waste! Did you know? Everyday hundreds of thousands of British people, get their take out coffee on their way into work and discard their coffee cups into the bin. 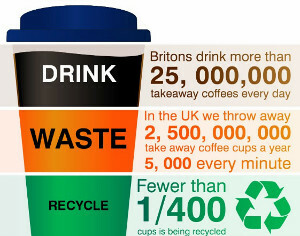 Millions of coffee cups go into landfill, building up a 25 tonne waste mountain of coffee cups every year. The best-selling British-made Americano Mug range offers an eco-friendly alternative to this problem.You can rest assured that your logo will be seen every morning, for your customers’ much-needed caffeine fix! Prices start from only £2.77 +VAT, excluding set-up and delivery, and will vary according to style and quantity, so please ask us for details today.